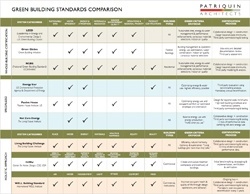 Download our free Green Building Standards Comparison! And get an at-a-glance view of the various standards for environmentally responsible design and construction. Are you looking to make your next project "green," but don't know where to start? We know that the guidelines for green certification programs like LEED, Energy Star, WELL Building Standard, and more can be confusing to say the least. That's why we've created this easy-to-read chart, that covers the criteria, building type, certification process and focus of each system. Whether you're looking for a holistic approach to green construction or are concerned about the long-term health of your building's occupants, our Green Building Standards Comparison chart will help you find the best green building standard for your project.